RoseStreet Energy Labs said it has created a prototype cell that combines gallium-nitride with silicon, a technology that it could license to silicon cell makers and produce on its own. A Phoenix company said it has created a solar cell that combines gallium-nitride with silicon, an unusual approach that achieves an efficiency of 25 percent to 30 percent. RoseStreet Labs Energy announced the prototype cell Monday, and it expects to start commercial production in the fourth quarter of 2010, said Bob Forcier, CEO of RoseStreet. When those cells come off the first production line, they should be able to convert 25 percent to 30 percent of the sunlight that falls on them into electricity, he added. That kind of efficiency would be a lot higher than what silicon cells on the market can achieve today. Currently, the most efficient silicon cells for sale come from San Jose, Calif.-based SunPower, whose cells have 22.5 percent efficiency. There are other types of cells that use alternative materials and perform much better than SunPower's, but they also are much more expensive and are developed mostly for solar panels on satellites. The majority of the solar cells on the market today are made with silicon, and their efficiencies are typically in the mid-teens. RoseStreet is seeking a way to boost silicon cells' efficiency by adding a layer of gallium-nitride which, unlike silicon and other more common semiconductors used for solar cells today, can be tuned to make use of photons from a broader range of spectrum, Forcier said. There may be another semiconductor used the cell, but Forcier declined to provide specifics. Gallium-nitride is a common material for making light-emitting diodes (LED), so sourcing it wouldn't pose a challenge, he added. "With gallium-nitride you can tune it for whatever [par of the spectrum] you want. It's like a piano versus the ukulele – you get more notes with the piano," Forcier said. "This technology allows silicon to be supercharged, like adding a big booster without a big cost penalty." The company's core technology came from Cornell University and the Lawrence Berkeley Laboratory. When the company announced its licensing agreement in 2005, it said the technology could lead to solar cells with more 48 percent efficiency. The company is working on other products that would reach that 48-plus efficiencies, Forcier said. The technology doesn't require RoseStreet to use silicon, and the company is working on coupling gallium-nitride with other materials, such as amorphous silicon, or deposit it on glass, Forcier said. But there is value to use silicon other than because it's cheap and abundant. RoseStreet could license its technology to other silicon makers that seek ways to significantly boost their products' performance, Forcier said. RoseStreet does plan to make and sell solar cells, but it would outsource manufacturing, he added. This approach is common in the semiconductor industry, and it's becoming popular with solar energy companies as well (see Contract Manufacturers Expanding From PCs and Phones to Solar Panels). Forcier declined to disclose any manufacturing costs as well as the pricing for its first commercial product. The company's plan is to reach a manufacturing cost of less than $1.50 per watt by 2014. That goal might not help the company market its solar cells at a time when some conventional silicon solar cell makers are already close to reaching that production cost if they haven't already, thanks to a rapid decline of silicon prices in the past year. Customers might prefer much cheaper silicon cells over more expensive ones, even though RoseStreet's products could produce more power. Forcier said the company would focus on markets where space for installing solar is limited and buyers are willing to pay more for high-efficiency products. He envisions seeing his company's cells in installations on top of high-rise buildings, embedded on cars' roofs or in laptop computers. 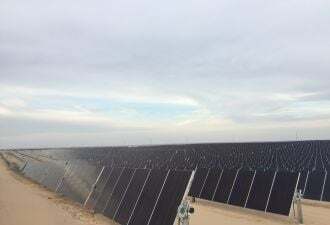 The cells also could be used for concentrating solar energy systems, which use lenses to concentrate the sunlight onto cells to increase energy production. Many concentrating solar technology developers are willing to pay more for high-performing cells because they could make use of smaller cells to get the same amount of power. The company received its initial, undisclosed funding from Japan-based Sumitomo Chemicals. RoseStreet plans to raise a Series A in the first quarter of 2010 to fund its commercial production. Forcier declined to talk about the fundraising goals.